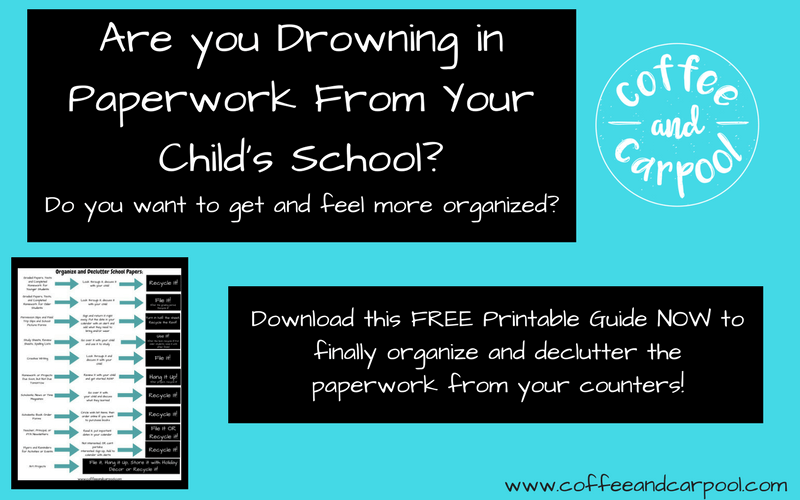 Inside: Are your counters being overtaken by school paperwork? 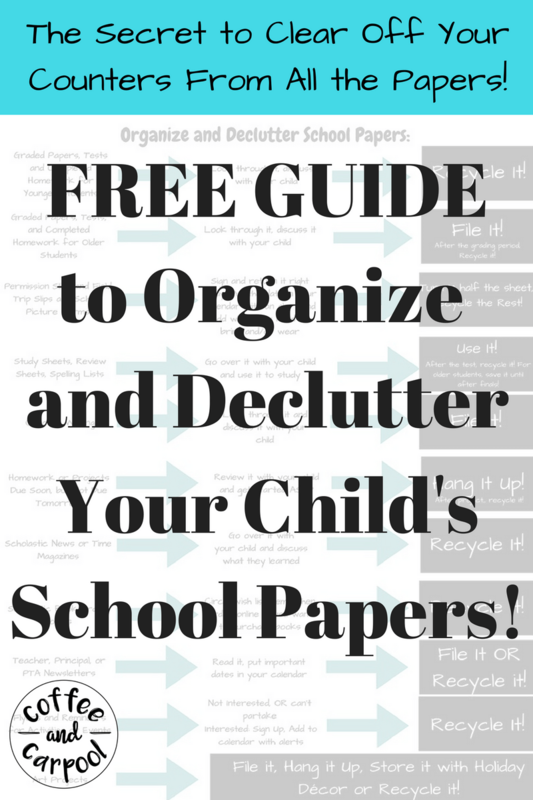 Does your child bring in way too many papers and dump them without you knowing what to do with them all? 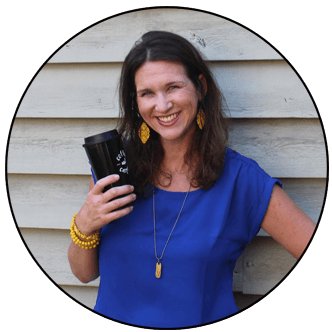 Do you feel disorganized and overwhelmed by the clutter? 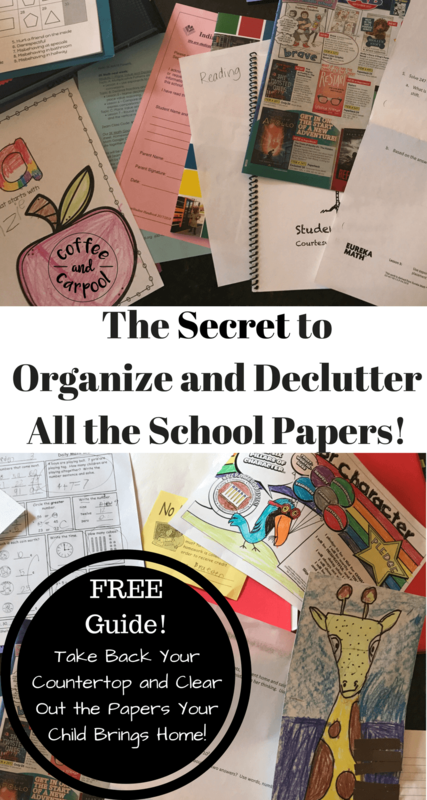 There’s a simple solution that comes with a FREE Guide to organize and declutter all the papers! 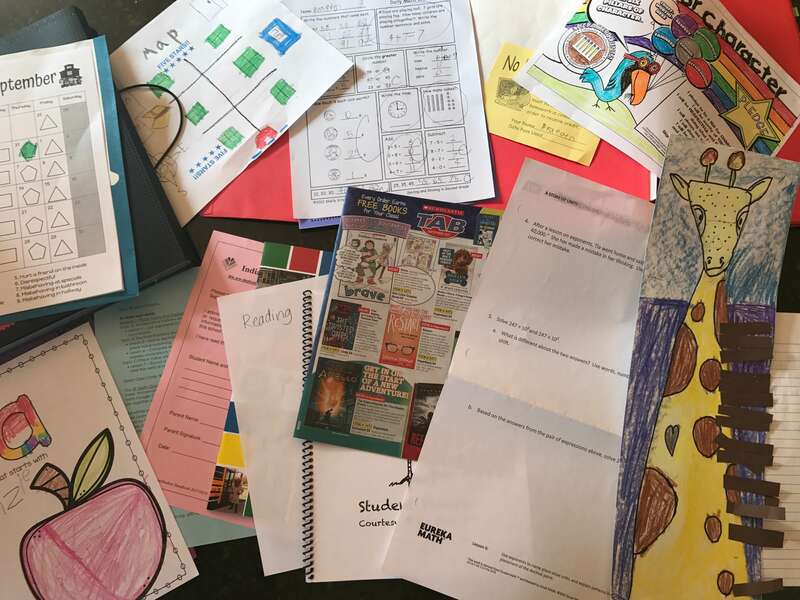 How to Organize and Declutter Your Child’s School Papers Once and For All! I don’t know about you, but I am constantly being given too many school papers. And now that I have three kids in school, the amount of papers coming in my home is out of control. As they tromp through the backdoor and unload their backpacks, I am inundated daily with 10-40 pieces of papers that I need to sift through. Friday Fun Days? Nope. Friday Extra Paper Day as they clear out and bring me all their classwork from their mailboxes. I get homework, corrected homework, unfinished classwork, graded classwork. Book Order Forms, Yearbook sign ups, PTA sign ups, Teacher Newsletters, coloring pages they did during free time, and permission slips to chew bubble gum in science class. I am not making this up. It all came home today. On the second day of school. I have learned over the years, that if I don’t take care of the school paperwork fast, I will lose important papers and I will feel overwhelmed and disorganized. Two emotions that don’t help my overall mental health. So, I use this simple guide and my trusty recycle bin to get the paper clutter under control. And now you can too! 1. Get the FREE Guide to literally guide you through how to clear out the stacks of papers. and 1 for each of your children. 3. Get magnetic clips to hang up special work and to hang up study guides/spelling lists on your refrigerator. 4. Get a box or a bin to store older students’ work until the quarter/reporting period is over. 5. Bonus: Get a notebook with plastic sleeves for kid’s artwork or schoolwork they just can’t part with. This way, they can flip through the book and look at their handiwork without papers all over your house. My ten year old still looks through her book we created when she was in Kindergarten. Two Tips to make the FREE Guide Work For You and Get Organized! 1. Go through backpacks everyday. If you let the papers pile up, you’re back to where you started. 2. Recycle your kid’s work when they are NOT standing next to the recycle bin. The classwork that they did a week ago will suddenly become very important to them as soon as they see it in the trash. I now have to use stealth mode when recycling. But it’s worth it to not be overrun with paperwork everywhere. Use the guide to help you recycle the stacks of school paper. Take back your counters! Need other Back to School Tips and Tricks that will save you time, money and headaches? 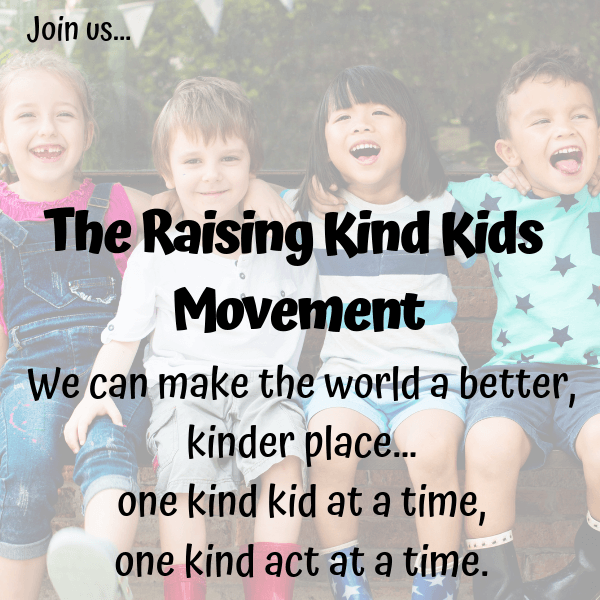 Need help with homework and want to understand how it can help your child? Did the guide help you take back your counters and get organized? What would you add to it? What else do you need to organize now? This is wonderful! I always feel guilty throwing stuff out, but I also don’t want to be a hoarder! 😂 Thanks for the tips! Ditch the mom guilt with the papers! 😉 The only time I feel guilty is when they catch me recycling and I they fish their stuff out of the trash bin! I’m excited to get the organizer. I literally just took a break because I’ve been organizing their school work! I’m so glad!! Let me know how it works for you! I so need this! My daughter brings home PILES of paper each day!! Isn’t it amazing how much they send home? And my school does a ton digitally! Hope the guide helps! This is great! I love your binder artwork idea, SO SMART. I’m definitely implementing that! My daughter’s in kindergarten and I think she has a lot of papers now! And I had to laugh about throwing away the artwork. My daughter always seems to find it, no matter how careful I am! 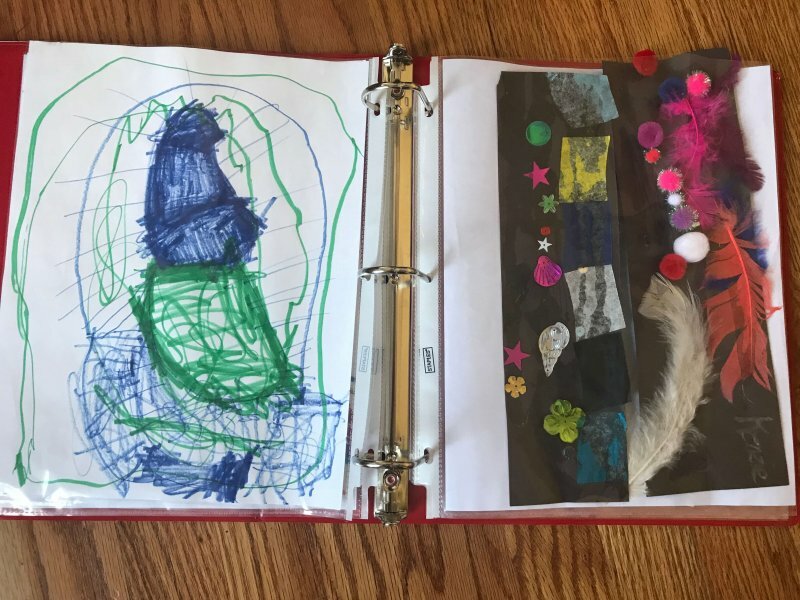 I love the art binders…I just found my son’s buried under his bed and it’s so sweet to see his old art work all in one place. I hope the guide to decluttering the school papers helps! I love the binder idea for artwork — great way to keep it, but out of the way and less cluttery feeling! I’m so glad! It’s an easy solution to the stuff you’re indecisive on. I really hope the guide helps you declutter the rest of it! Great tips. I’ve been organizing my daughter’s work into expandable folders by the month. It’s working well so far, but I’ll probably need a better system when she is older. Recycling your kids artwork, you speak my language 🙂 Moms definitely have to do that in the dark of night. I keep a folder in my kitchen that all school papers destined for the recycle bin go in to. Then I can empty it when the opportunity presents itself. Going through the backpack every day is absolutely key, if you miss one day, you’ll be sorrry.